From the US in 1814 this is a clove scented flower that blooms in clusters, very few thorns. The buds open a very soft pink fading to white. From 1985, Bride's Dream produces large (5") exhibition blooms. Like all Hybrid teas, these are formed on solitary stems. 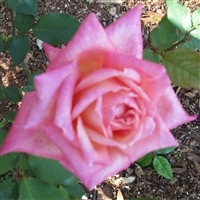 A Bermuda Rose with blooms some 3" in diameter, very reliable rebloom, the petals have a soft cream like appearance. Bred in 1935 this single petaled rose offers a stunning contrast in color between the dark stamens and the soft yellow petals. The blooms form in clusters and the petals fade to a white blend with age. Classed as a climber this variety may also be trained on a pillar. The first of the Noisette class of roses, this rose blooms in a light pink and fades to white, the blooms are in clusters. It can grow rather tall if allowed to. A winner of many awards with a strong pleasant fragrance and a deep red bloom this variety remains a favorite over half a century after its introduction. An 1899 introduction, this variety makes a good pillar rose or it can be grown as a shrub. The blooms are quite large, dead heading will encourage re-blooming with this variety. Intense fragrance. It is very easy to fall in love with the rich color of this rose. A sweet fragrance to be enjoyed on this plant, which may be grown as a shrub or pillar. From 1918 this rose will produce clusters of yellow flowers for your enjoyment. Vigorous growing, yet easily managed. Dark green foliage.